Take a good look at this bag. 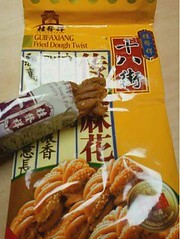 It says “Guifaxiang Fried Dough Twist” on the outside, and on the inside is the most insidiously delicious Chinese sweet I’ve ever had. “It is cultivated as an ornamental plant in gardens in Asia, Europe, North America, and elsewhere in the world, for its deliciously fragrant flowers which carry the scent of ripe peaches or apricots.” The flowers are called guì huā, meaning “cinnamon flower” or “cassia flower,” and are often mixed with green or black tea leaves to create a scented tea called guì huā chá (桂花茶). I’ve seen the word before, but never knew what it was. Every day an adventure.